The writers of “Tales from The Woods” talk about their plays. October 31st might have passed but Hallowe’en isn’t quite over yet! For those of you, my faithful witches and wizards and other magical creatures, Theatre Upstairs has a very special gift! 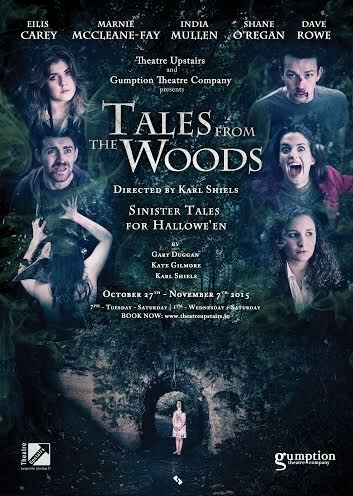 Tales from The Woods has entered in its second week and the reviews are absolutely raving! If you haven’t seen the play yet then I don’t know what you are waiting for! It’s an opportunity not to miss… Some of finest Irish writers and actors have come together to make this piece happen. I, in my turn, had an amazing chance to ask the writers of Tales from the Woods a few questions about their mini-plays. And here is the result. Karl Shiels, Kate Gilmore and Gary Duggan explain what they wrote this particular piece, who inspired them, what was the most enjoyable/challenging and much much more. Can you tell me what your own piece is about? Karl: My play is about two brothers standing trial in front of the creatures of the forest for the murder of a boy. Kate: “The Ballad of Ginny Fogarty” is about three young women playing truth or dare around halloween and find themselves in Ginny Fogarty’s cottage in the woods. Alone. Gary: A man’s car breaks down on the edge of the woods and he meets a little girl who says she’ll lead him to a phone. They walk through the woods together and we gradually realise that they both have secrets. What/Who inspired you to write this piece? Karl: The play is based on a very early Grimm Brothers tale called How Some Children Played at Slaughtering, it appeared in their very first publication of Grimm Tales but was never printed again. Some say it’s because their other “popular” tales grew longer, some say the subject matter was too harsh. Kate: I was inspired by the old Irish song ‘The River Saile’ which I heard at various family parties throughout the years and now find very unnerving. It was the first thing that came to mind when I received the phone call from Karl. Gary: Well Karl Shiels inspired me to write it, saying it only had to be ten minutes long and creepy. That was hard to turn down! Beyond that, I instantly thought of the Little Red Riding-Hood story and some way to put a modern twist on it. What was the most challenging moment of writing this piece? Kate: I was performing and rehearsing for ‘The Train’ while writing this piece and found it difficult not to be influenced by that. Obviously in some ways, it’s good to take from your own experiences and I think I found a balance in the end. For example, the female empowerment I felt during rehearsals made it impossible for me to write for anyone other than the three female actors from Gumption. Gary: It came out quite easily, as I sometimes find with short pieces with a specific purpose. What was most enjoyable about writing this piece? Karl: The most enjoyable thing about writing this tale was getting to work with such talented and dedicated actors. Pure joy. Kate: I always find limitations quite freeing so the fact that the piece could be no longer than 12 minutes made it really exciting. I had to achieve what I wanted to in that space of time. Gary: Being able to play around with language and the theatricality of how it would appear on stage, after writing a lot of stuff recently that was rooted in realistic naturalism. What lesson (if any) can we learn from your tale? Karl: The lesson to take from our tale would be…Be careful what you choose in life as it may have deadly consequences. Kate: Curiosity really does kill the cat. Gary: Don’t do bad things. And don’t go into the woods when the sun is starting to set. Can you describe your play in three words?